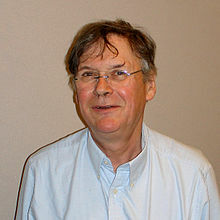 Sir Richard Timothy Hunt FRS (born 19 February 1943 in Neston, Cheshire) is an English biochemist. He is usually known as Tim Hunt. Hunt shared the 2001 Nobel Prize in Physiology or Medicine for his work on cell division. At the age of eight he was accepted into the Dragon School, where he first developed an interest in biology thanks to his German teacher, Gerd Sommerhoff. When he was fourteen he moved to Magdalen College School, Oxford, where the science prizes now bear his name. There he became even more interested in science studying subjects such as chemistry and biology. He is a son of Richard William Hunt. In 1961, Hunt was accepted into Clare College, Cambridge to study natural sciences, graduating in 1964 and immediately beginning work in the university Department of Biochemistry. He finished his PhD in 1968 and worked in New York to work on protein synthesis. Tiny amounts of glutathione inhibited protein synthesis in reticulocytes (immature red blood cells), and tiny amounts of RNA killed the synthesis altogether. After returning to Cambridge he continued work on substances which started or inhibited protein synthesis. In 1982 at the Marine Biological Laboratory at Woods Hole, Massachusetts, he used the sea urchin (Arbacia punctulata) egg as his model organism. He discovered the cyclin molecule. Hunt found that cyclins begin to be made after the eggs are fertilized and increase in levels during interphase, until they drop very quickly in the middle of mitosis in each cell division. He also found that cyclins are present in vertebrate cells where they also regulate the cell cycle. His group showed that cyclins bind and activate a family of protein kinases, now called the cyclin-dependent kinases. One of these had been identified as a crucial cell cycle regulator by Paul Nurse. In 1990, he began work at Imperial Cancer Research Fund. In 2001 he was awarded the Nobel Prize in Physiology or Medicine with Leland Hartwell and Paul Nurse for their work on cell division. Other honours followed, and he was knighted by the Queen in 2006. Hunt is married to Mary Collins. The couple have two daughters. ↑ Now known as the Cancer Research UK London Research Institute in the United Kingdom. "Cancer Research UK: Tim Hunt". Retrieved 2008-11-13. ↑ "Royal Medal recent winners". Retrieved 2008-11-13. ↑ "Advisory Council of the Campaign for Science and Engineering". Retrieved 2011-02-11.